Yesterday I have updated my iOS to version 12.0. My iPhone has only 16 GB of storage and that sometimes causes troubles. Occasionaly I look at the iPhone Storage in Settings and I do some cleaning. I was surprised and wondering why does the "Other", which is basically the iOS, take so much space. Apple should know that there are still people in this world that use iPhones with 16 GB storage every day. I followed several recipes how to increase the free space in iPhone, but still: why does the iOS take so much space? This week I have found an article on OSXDaily, describing a very unusual way (for me) how to reduce the "Other" storage space. Before I tried this method, my "Other" took around 8 GB of storage. Then I connected my iPhone to iTunes, actually I did a back up, one restart and in total waited approximately 30 minutes (the iPhone was still connected to iTunes via cable). 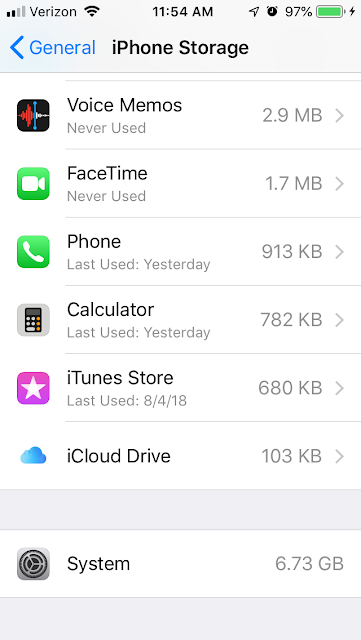 No idea what happened but the system really reduced its size, to 6.7 GB! Not bad! However I would like to know more about what is actually the iPhone and iTunes doing.